This promises to be the Oxton entertainment highlight of the year. The Projection House will be raising money for the Notts Air Ambulance and to buy sound equipment for the Oxton Film Club. The aim is to donate at least £250 or 50% of any surplus raised to the Notts Air Ambulance. Cold starter, hot main course and assiete of desserts. Dance until midnight to music including Disco Inferno from Dagoba. Pre-order wine list and a bar serving draft beer. Charity Auction, with prizes including a flight in a light aircraft, wine tasting and a Relax Day for two at Lakeside. It’s anticipated that tickets will sell out quickly as numbers are limited, so please apply for your tickets, or a table, as soon as possible. 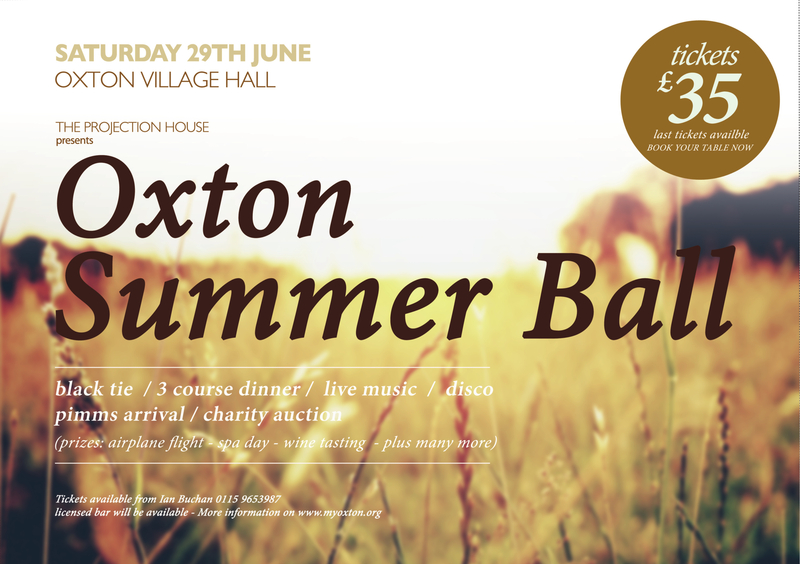 Tickets are priced at £35 each, sitting at tables of 8 or 10 with linen and candelabras. For tickets please contact Roy Walker on 0115 9653595.